I'm being released tomorrow from Physical Therapy -- two weeks of at home PT and 3 weeks of outpatient PT. I'm a good patient and I've accomplished everything that I need to so . . . . the therapists that I've spent the summer with (or so it seems) I'll be saying goodbye to tomorrow. 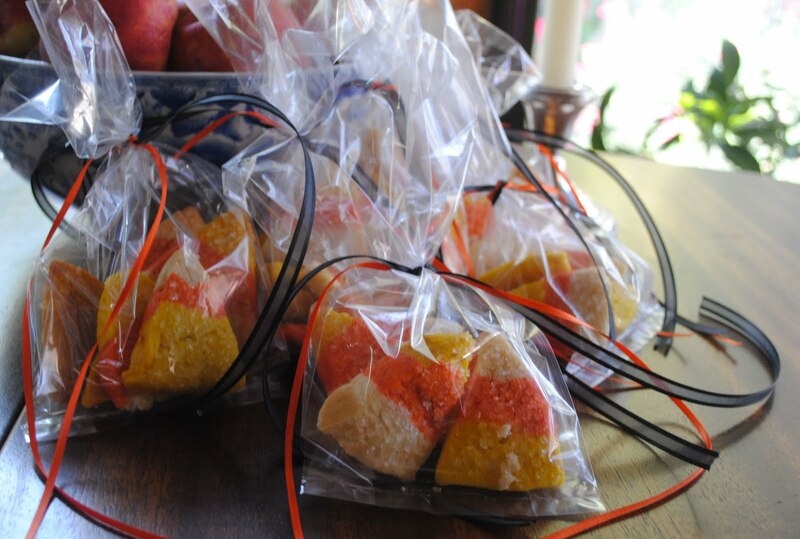 But I can't just say goodbye -- no, I have to leave them with a treat and since it is so close to Halloween -- what better "thank you" than a sack of Candy Corn Cookies! They're not my invention, but rather I found them on Cathy's blog -- Wives with Knives. She's a lot cleverer with them than I was -- but they are fun cookies! To make and to eat!!!! And they are so cute!!!! They are small cookies -- about a couple of bites per cookie and the recipe does make a lot -- so what did I do with the remainder? Had tea, of course!!! They're a perfect pre-Halloween tea nosh!!! 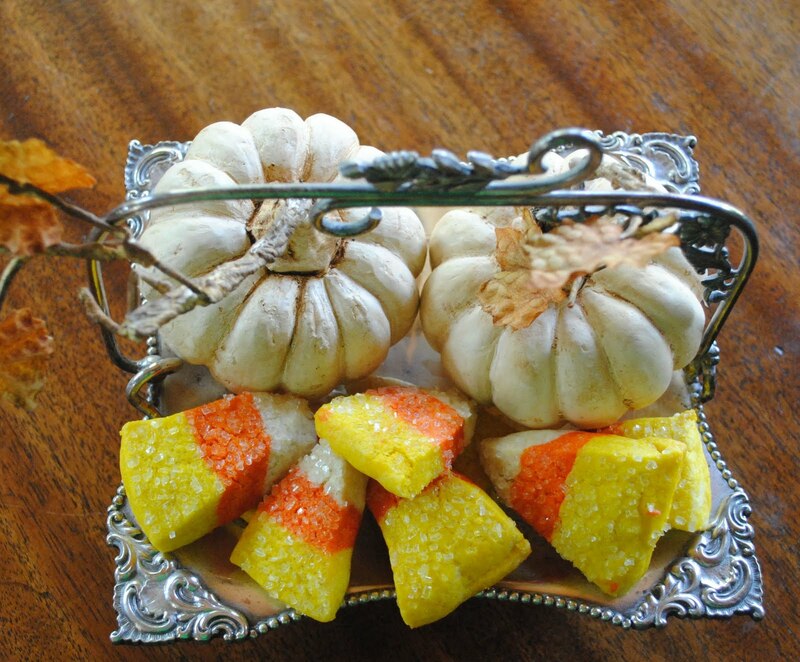 A new little Victorian silver bon bon dish with some white pumpkins and my share (or at least with this pot of tea) of the candy corn cookies. Actually, there are more left, and I'm sacking up some more to drop off at some of my friend's homes for their grandchildren. I do miss the trick or treat days of my youth when your trick or treat loot included some great homemade cookies as well as apples and popcorn and popcorn balls. Wouldn't any little ghoul or goblin just love a sack of these Halloween night? Sigh, we give full size Snickers instead. It's Friday which means that I'm joining Michael at Designs by Gollum for Foodie Friday. It's always fun to see what everyone has been doing in the kitchen over at Michael's! Cream butter and sugar. Add egg and orange juice and zest. Mix well. Combine flour, salt and baking soda, mix well, and add to butter mixture. Mix until well combined. Divide dough into 3 equal parts. Add orange food coloring to the first part and blend well. Add yellow food coloring to the second part and thoroughly blend. Use enough coloring to make vibrant colors because they fade during baking. Leave the third part plain. Line a loaf pan with parchment paper. Press the yellow dough evenly onto the bottom of the pan. Press the orange dough evenly over the yellow dough, and press the uncolored dough on top. Wrap the parchment paper over the dough and refrigerate several hours or overnight. When ready to bake cookies remove parchment paper and slice dough into 1/4 inch slices. The the pieces into triangles, dip one side in sanding sugar and bake on a parchment lined sheet at 375 for 7 to 9 minutes. The sanding sugar adds sparkle and crunch to the cookie and really dresses it up. "A loaf pan size wasn't indicated in the recipe so I used a 9 x 5 inch pan. The cookies are perfect to fit little gift bags and boxes, maybe two small bites and next time I'll use a smaller pan to produce a larger cookie. There won't be as many cuts in a row, but they will be taller because of the smaller pan. Just a thought." 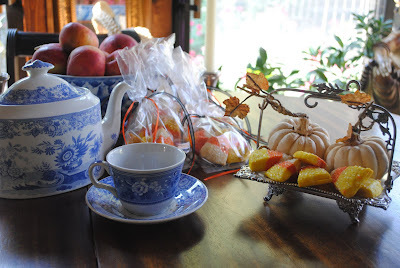 It's always Thursday which means that it's time for Tablescape Thursday -- I have either been gone or so busy this week that I've not even had time for my afternoon tea. This Thursday I rectified that and am sharing my tea for one with Susan at Between Naps on the Porch. Many congratulations on your "graduation" from physical therapy! Those candy corn cookies are the cutest ever! I'm glad the recipe made a lot to share -- and enjoy yourself! It's great that you have made such a good recovery - you've obviously been working very hard to get your fitness back. Congratulations! What a great idea and cute too. I'm going to have to try them out.Congrats on your PT progress. Congratulations on being a good patient! Those cookies are just too cute! What cute cookies! This is a fun time of year with all the treats. Love your little pumpkins. YaHoo! No more theraphy for you! Those little cookies are simply darling. I can remember Halloween night in our small town . . .my favorite treats were a real banana, homemade popcorn balls, freshly baked cookies, sugar donuts, and apple cider in little cups! Seems like we've taken a step backwards in our thinking, doesn't it? I'm sure the children that come to "Trick~Or~Treat" feel very special. If only they knew what they were missing? Hm-m-m. . . The cookies look terrific. I do love candy corn. I also love the term "sanding sugar". Your cookies will be well received I'm sure:@) Glad to hear you're doing so well! Your cookies look delicious! If you need someone to check them for quality, I'm your girl! These are so cool! May have to try them this weekend! I'm so happy that your are recovering so well, Marilyn. I agree that these little cookies are perfect with a nice cup of tea. Yours are picture perfect. Thanks so much for the link back to my blog. So glad you are doing better! And how thoughtful to make a gift for the PT department. These are so cute. But you are making me hunger for a homemade popcorn ball. My family never made them and I could only get one on Halloween. Poor Modern Kids! I saw these on Cathy's blog and it is so nice to see them on yours. They look just as fun and delicous. Now I'll have to make these for sure! Made these myself last week for a shower for my granddaughter and then took them to a "girl's get away Art week". They are delicious. I even forgot the egg -took them out of the pan (yes, I already had them layered in the pan), separated the colors (a little tricky), mixed up the egg and poured it over the 3 colors and kneaded it into the dough. They were still delicious. Believe it or not, I am known for my cooking--not for my memory about adding ingredients. Ha! those are adorable cookies..might be able to make some for my grands..
Congratulations on having done so well with your PT! And it's so Martha to have made these delightful cookies as a farewell/thank you gift to your therapists. I too miss the days when Halloween was a time for visiting treasured family friends and sharing homemade treats. My mother's cupcakes were enjoyed by at least three generations of trick-or-treaters. Even after wrapped store-bought candy was the only acceptable offering, she had her "reserve stock" prepared for the little visitors she recognized. I'll be making her spice cupcakes with homemade caramel icing next weekend (for invited guests only) with Reece's and Snickers in a bowl near the front door. very cute I bet they taste better than the real candy, I wanted to make a cake like that but probably won't get time to. Yahoo on your release from PT! A happy post, and I especially like the candy corn cookies with the white pumpkins. I love these sweet cookies. I still do something fun for the kids that know me. Oh those are just plain cute! What a great idea!!! Wonderful to hear you are recovering so well. Hope it continues. Cookies are so cute. A thoughtful way to say thank you! Think I will try them and your pumpkin soup recipe. Yeah!! So delighted that physical therapy is over for you. Your cookies look so great, I'll have to try them myself for the grands.. who am i kidding.. for myself!